The utm will consists of the URL of your website ( www.example.com), a question mark followed by all parameters you have defined. By creating UTM parameters for your campaigns you can easily track any information using Google Analytics. How UTMs work in ContactPigeon? Please note that UTM_campaign code cannot contain space. You can use underscore or hyphen instead. 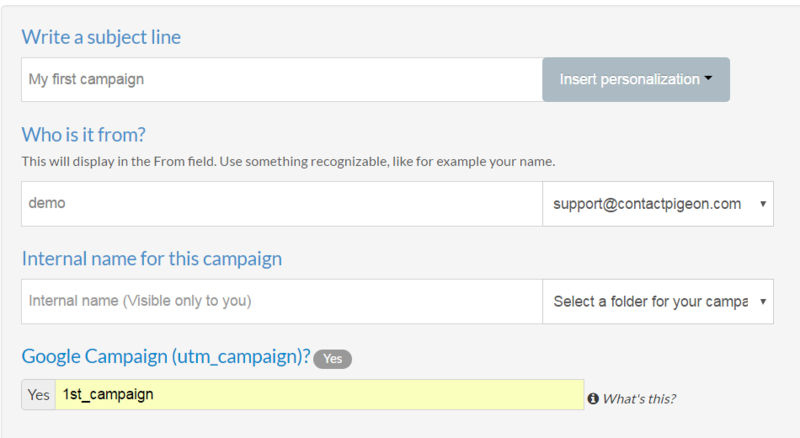 You can track email campaigns using different values. You just have to generate the tagged URLs manually and either add them to your campaign source code (if it's an imported campaign designed externally) or use the insert hyperlink button in the email editor.